What We're Reading: Seriously Though, What IS Michael Jordan Wearing? Google's Vote: Google now has enough power to decide who's president of the United States, according to researchers studying the search giant's algorithms. Robert Epstein explains in Politico Magazine how his studies have shown that just changing the order of search results on different candidates can sway voters enough to clinch and election. Sam Cholke is trying to soothe his skepticism with Epstein's claim that he's proven it in the lab and also in the wild and wooly world of politics. Epstein calls it a threat to democracy to allow a technology that can sway elections so heavily to be protected as a trade secret. Let's scan the list of threats to democracy because hopefully there's another equally sizable threat somewhere here that counteracts Google's latent power. Michael Jordan's Threads Never Cease to Amaze: The basketball superstar was in town recently for a court case, and the Tribune asked a Chicago tailor to weigh in on his outfits, which are notoriously puzzling (see the glorious Tumblr: "What the f--- is Michael Jordan wearing?") 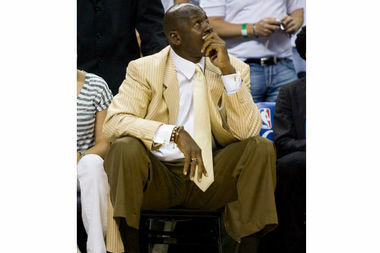 Turns out, Jordan is still rocking ill-fitted, baggy suits that were popular in the 1990s. Reporter Mina Bloom's favorite is the gray suit jacket with the slightly-lighter-in-color gray suit pants. Who signed off on that? How To Find Purpose In Your Life Post-Presidency: After being president of the United States, it's probably pretty easy to feel like your life is all downhill from here. But Ariel Cheung is reading a behind-the-scenes look from Politico at what lies in store for Barack Obama come January 2017. At 56, Obama is looking at a lengthy post-presidency, and Obama BFF Marty Nesbitt said "it doesn't matter who the next president is, or from which party: Obama's not planning to step back."